Choreography by Jeri Kansas - Read the feature on Jeri here! New Yorkers Tommy Albright and Jeff Douglas have traveled to the Scottish Highlands on a game-hunting vacation, only to get lost their first night out. While discussing Tommy's general ennui, they begin to hear music ("Brigadoon") and notice in a valley nearby, a village, where the map shows nothing. Tommy and Jeff decide to visit it, if only to get directions back to their inn, and they walk toward it. Meanwhile, in the town itself, a fair has begun ("McConnachy Square"), with the local vendors selling milk, ale, wool, and such. Everyone is dressed in traditional Scottish tartan apparel, replete with kilts, sporrans, and ghillies. The villagers include Meg Brockie, a dairy vendor with a taste for gentlemanly companionship; Angus McGuffie, her employer; Archie Beaton, seller of wool and plaids; and his son Harry. The MacLaren family enters, consisting of patriarch Andrew and his two daughters Fiona, a young woman of about 24, and Jean, her dainty, sweet younger sister. They have come to purchase supplies for the wedding of Jean to Charlie Dalrymple. Poor Harry Beaton is madly in love with Jean, and he is very depressed at the thought of her marrying another. One of the other girls asks Fiona when she will get married, and she responds, "When I find someone who makes me think of it." She would rather wait to find true love than end up marrying the wrong person ("Waitin' For My Dearie"). Just then, Tommy and Jeff wander in from the hillside. They and the Scottish folks stare at each other with bewilderment until Tommy asks where they are, and are told "Brigadoon". Fiona introduces herself to Tommy and offers the Americans a bite to eat and a place to rest. Meg immediately takes a liking to Jeff and leads him off, as Charlie Dalrymple appears. He's a handsome young man. He shares some celebratory claret with Tommy, toasting to a Mr. Forsythe whom he thanks for "postponing the miracle". Tommy asks what he means by this, but Fiona shushes him and leads him away, as Charlie sings about the end of his bachelorhood ("Go Home with Bonnie Jean"). Tommy and Fiona talk about his impending marriage to his fiancée Jane in New York; Tommy is in no hurry to marry her, and sparks begin to fly between him and Fiona when she reveals that she likes him very much, although she "dinna" like anything he says. She must go to gather heather for the wedding, and Tommy insists on going with her ("The Heather on the Hill"). Meanwhile, Meg takes Jeff to a place in the forest with a shack and a cot where he can get some sleep. She tells him she's "highly attracted" to him, but he wants nothing but sleep and spurns her advances. She reveals her unusual love life ("The Love Of My Life") as he falls asleep. In the MacLaren home, Jean's friends are helping her pack her things to move into Charlie's home ("Jeannie's Packin' Up"). Charlie arrives to sign the MacLaren family Bible. He wants to see Jean, but he is told it is bad luck to see her on the wedding day. He begs for her to come out anyway ("Come to Me, Bend to Me"). Tommy and Fiona enter with a basket full of heather they have picked. Fiona goes upstairs to help Jean dress for the wedding, and Jeff enters wearing a pair of Highland trews (trousers); apparently his own pants have been damaged on a "thistle". Jeff finds that Tommy is so happy that he can barely contain it ("Almost Like Being In Love"). Then Tommy notices the family Bible, which contains the names of all the people he has met that day, but every important event attached to them, including the impending wedding of Charlie and Jean, is listed as if it had happened two hundred years earlier. He calls Fiona down to question her about this, and she tells him that he needs see the schoolmaster, Mr. Lundie, to get the full explanation. Fiona, Tommy, and Jeff arrive at Mr. Lundie's home, where he relates a story that the two New Yorkers can hardly believe: two hundred years ago, the local parish pastor prayed to God to have Brigadoon disappear, only to reappear for one day every 100 years, to protect it from being changed by the outside world. None of the people of Brigadoon can be permitted to leave the town, or it will disappear forever. Tommy, looking at Fiona, asks hypothetically if an outsider could be permitted to stay. Mr. Lundie replies, "A stranger can stay if he loves someone here - not jus' Brigadoon, mind ye, but someone in Brigadoon - enough to want to give up everythin' an' stay with that one person. Which is how it should be. 'Cause after all, lad, if ye love someone deeply, anythin' is possible." The group leaves to go to the wedding, which opens with the Clans coming in from the hills. Charlie and Jean are married by Mr. Lundie, and they perform a traditional wedding dance to celebrate. Sword dancers appear, led by Harry, and they perform an elaborate dance over their weapons. All the town joins in the dance, but abruptly halt as Jean's scream alerts them to Harry trying to kiss her. In anguish over Jean's wedding, he announces that he's leaving the town (which would end the miracle, causing Brigadoon to disappear forever into the Highland mists) and sprints away. The men of the town, including Tommy and a reluctant Jeff, are frantically trying to find Harry before he can depart the town ("The Chase"). The music becomes more and more agitated, and suddenly an agonized scream is heard. Harry Beaton, who appears to have fallen on a rock and crushed his skull, is found dead by the other men. They decide not to tell the rest of the town until the next morning so that the wedding can continue without further grief. The men carry Harry's body away, and Fiona and her father arrive to see if everything is all right. As Mr. MacLaren leaves, Tommy sees Fiona, and they embrace. She reveals her love for him, and he tells her he believes he feels the same way ("There But For You Go I"). Fiona reminds him that the end of the day is near, and Tommy tells her he wants to stay in Brigadoon with her. They go to find Mr. Lundie. Meanwhile, in the village, Meg tells about the day her parents were drunkenly married ("My Mother's Wedding Day") and the townsfolk begin to relax and dance again, until the sound of the Highland Pipes pierces the air. Archie Beaton enters carrying Harry's body, led by the pipers playing a pìobaireachd, and Maggie Anderson, who loved Harry, performs a funeral dance for her unrequited love. The men of Brigadoon help Archie carry his son to the burial place. Tommy finds Jeff and tells him of his plans to stay. Jeff thinks the idea absurd and argues with Tommy until he has convinced him that Brigadoon is only a dream. He also reveals that it was he who tripped Harry and accidentally killed him. Fiona and Mr. Lundie enter, and Tommy, shaken by Jeff's confession, tells Fiona that even though he loves her, he cannot stay; he still has doubts ("From This Day On"). Fiona tells Tommy that she will love him forever as she fades away into the darkness. Four months later, Jeff is drinking heavily at a hotel bar in New York. Tommy enters and greets Jeff. Tommy has been living on a farm in New Hampshire since his return from Scotland. He is still in love with Fiona; he cannot stop thinking about her and daydreams of her constantly, to the point of being unable to hold a conversation with anyone. 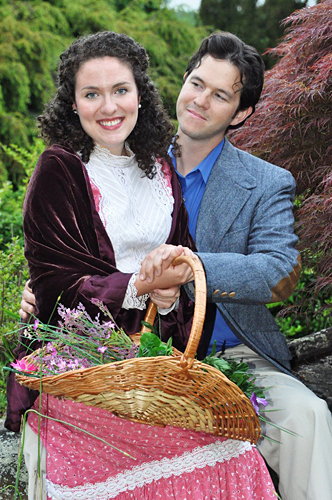 Jane Ashford, his fiancée, a beautiful socialite in her late 20s, talks to him about their impending wedding, but everything she says causes him to hear Fiona's voice and dream of Brigadoon (Reprises of "Come to Me, Bend to Me" and "Heather on the Hill"). Tommy focuses on the present long enough to interrupt her and tell her that he cannot marry her. She argues with him, but he continues to daydream about his true love (Reprises of "Go Home With Bonnie Jean" and "From This Day On"). As Jane leaves, Tommy calls Jeff and tells him he wants to return to Scotland, although he knows the village will not be there. Tommy and Jeff return to the spot where Brigadoon was and as expected, nothing is there. Tommy laments, "Why do people have to lose things to find out what they really mean?" Just as he and Jeff turn to leave, they hear the music again ("Brigadoon"), and Mr. Lundie appears. Tommy walks across the bridge in a daze to him, as Mr. Lundie explains: "Oh it's you Tommy, lad. You woke me up. You must really love her," to which Tommy, still dazed, stammers "Wha- how....?" and Mr. Lundie replies "You shouldna be too surprised, lad. I told ye when ye love someone deeply enough, anythin' is possible. Even miracles." Tommy waves goodbye to Jeff, and disappears with Mr. Lundie into the highland mist to be reunited with Fiona and live happily ever after.